Do you want the best-selling truck in America? 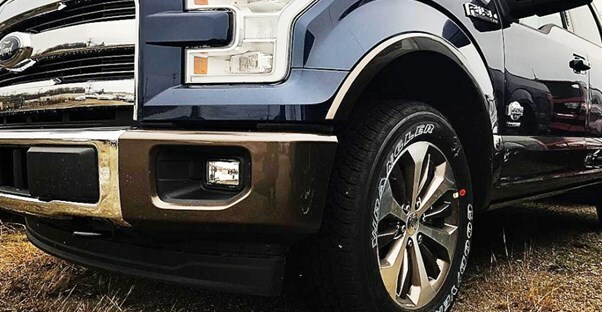 The Ford F-150 has long held that title by being one of the strongest trucks on the market. Not only can it tow more than any other truck its size, but it's also built to last for years. Once you’ve picked the F-150, you still have to choose between the various trims, which can feel impossible. This breakdown can help you figure out which trim works best for your drive style and job. The XL comes in a variety of cab options and is the cheapest trim at $26,730. There is a range of engine options from the standard 2.7-liter to 5.0-liter, which affects your gas mileage and towing power. (Of course, the larger the engine, the more expensive the truck may become.) The XL comes standard with an automatic transmission, but few thrills. It doesn’t have Bluetooth connectivity, although the XL can include Sync for an extra cost. The Ford F-150 XL gets 18 mpg in the city and 24 mpg on the highway. The XLT is the next step up at $32,100. It offers more than the XL, and the extra features may mean the upgrade may be worth it for some. The most beneficial feature is the ability to connect your phone through Bluetooth through the Sync technology. It comes standard with a 3.5-liter engine, which gets 18 mpg in the city and 24 mpg on the highway. Additionally, the XLT comes with privacy tint in the rear window. The Lariat has a significant price increase from the XLT, to $40,460. Unlike the other options, you do not have the option to get the 3.5-liter V6 FFV engine, but you can choose to install the 3.5-liter V6 EcoBoost, which gives better gas mileage. It comes standard with a 2.7-liter engine, which gives the driver 19 mpg in the city and 26 mpg on the highway. The Lariat comes with everything the XLT has plus LED box lighting, Fog lamps, an eight-inch productivity screen, and rear power sliding glass window with privacy tint and defroster when you have a SuperCab or SuperCrew cabin. It also comes with BoxLink, which can secure a wide variety of accessories such as ramps, storage bins, dividers, and more. The Raptor has a starting MSRP of $48,325 and gets the lowest gas mileage of any Ford F-150 at 15 mpg in the city and 18 mpg on the highway. This is because it’s equipped with a high-output 3.5-liter V6 engine with auto stop and start. Along with everything the Lariat comes equipped with, the Raptor also has quad-beam LED headlamps and LED taillamps with black surround. The Raptor also has some exterior upgrades such as cast aluminum running boards, heavy duty front and engine skid plates, and a unique grille with Ford in block letters. King Ranch increases slightly from the Raptor to $50,280 but comes with more technological features. It has a remote tailgate release and 110-volt/400-watt power inverter on the instrument panel in addition to what comes with the Raptor. One of the biggest upgrades with the King Ranch edition is Sync 3, which has a new design and interface. The color touch-screen displays phone, audio, and available navigation functions. It’s capable of swipe features and even comes with Siri Eyes-Free for your iPhone. Sync 3 also allows your King Ranch to connect to Wi-Fi. The King Ranch gets 15 mpg in the city and 22 mpg on the highway. The Platinum edition starts at $52,835 and works to out-do the King Ranch. It has everything the previous model contains, but also has serious upgrades. The standard Platinum equipment includes automatic high beams, black carpet flooring with unique front and rear mats, rain-sensing wipers, and a black leather-wrapped steering wheel. The gas mileage for the Platinum remains at 15 mpg in the city and 22 mpg on the highway. The Limited is the most expensive F-150 model offered by Ford at $59,600. It’s natural to expect this trim to come with the best of the best, and it delivers. Along with everything the Platinum comes with, it also has a 360-degree camera with split-view display, adaptive cruise control and collision warnings with brake support, a lane-keeping system, black mesh grille insert, and satin chrome door handles with a boxy color bezel. The Limited also gets better gas mileage than the Platinum at 18 mpg in the city and 25 mpg on the highway.